If medical experts deem using marijuana as a legitimate solution to treat concussions and other head injuries, the NFL would consider allowing athletes to use it, NFL commissioner Roger Goodell said Thursday. 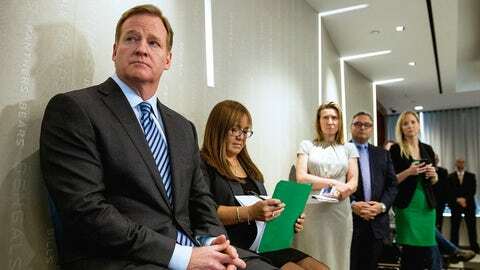 While attending a sponsored event, which announced the first 16 winners of the $20 million “Head Health Challenge,” Goodell was asked about the topic and didn’t dodge his recent comments on drug use by active players. "I’m not a medical expert. We will obviously follow signs. We will follow medicine and if they determine this could be a proper usage in any context, we will consider that," Goodell said. "Our medical experts are not saying that right now." Both the Seahawks and Broncos, who are playing in Super Bowl XLVIII, reside in states where the drug is legal for recreational use. A report on HBO’s “Real Sports with Bryan Gumbel” estimated that somewhere between 50 percent and 60 percent of the league’s active players regularly use the drug to deal with pain. The league is also looking into a few other preventive options in diagnosing head injuries on the field. "Not only are we going to get better at diagnosis, but we’re going to make a difference in the prognosis and the treatment," Goodell said. "People are going to get better."